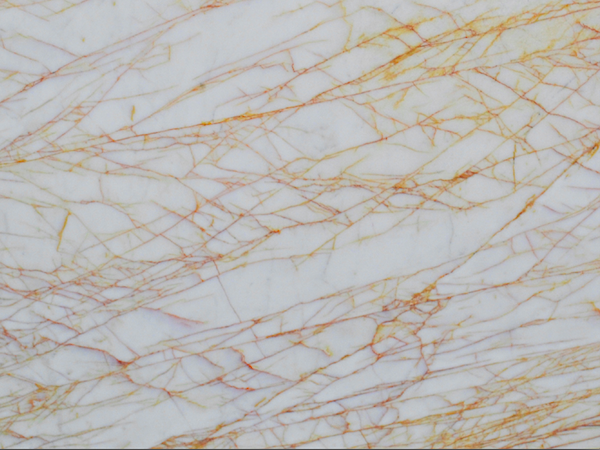 Appearance: Pure white background with a full scale of cobweb of golden/deep orange threads. Properties: Golden Spider has good physical, mechanical and technical characteristics (compression strength: 1598MPa; abrasion coefficient: 0.20). Colour variations and movement occur, even in the same batch. It is recommended to seal this stone to extend its longevity. Use: Due to its good wear resistance, this natural stone is suitable for all internal and some external applications, including floors (indoors only), cladding, surfaces and bespoke stonework, within domestic and public environments with moderate traffic, such as stairs, tables, countertops, shower trays and vanity units. Finishes: Polished, honed, brushed, sanded, bush-hammered and flamed. Projects: Sartoria restaurant, Mayfair (London).